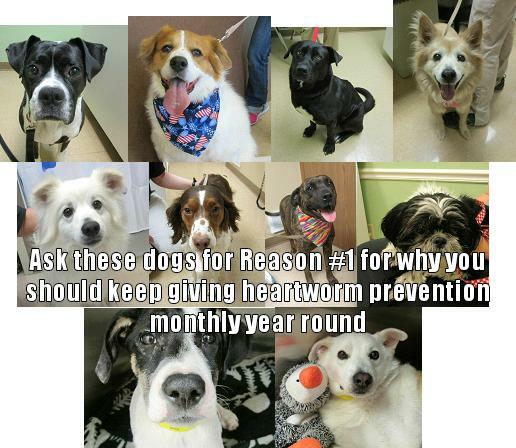 Reason #10 to give your pet heartworm preventative every 30 days year-round: There were 562 dogs treated for heartworm disease in St. Louis county in 2016, but who knows how many dogs have it but have not been diagnosed? Reason #9 to give your pet heartworm preventative every 30 days year-round: Prevention can be as simple as giving your dog a tasty treat on the first of every month. Reason #8 to give your pet heartworm preventative every 30 days year-round: All it takes is ONE mosquito bite anywhere on the body (even the nose) to transmit this serious disease. Reason #7 to keep your pet on heartworm preventative every 30 days year-round: It can take up to 3 months after a mosquito bites for the heartworm larva to travel to the blood stream where it is killed by heartworm preventative. In other words, if your dog is bitten by a mosquito in September, the heartworm preventative may not be able to kill it until a dose is given in December! Reason #6 to give your pet heartworm prevention every 30 days year-round: Treatment for heartworm disease can potentially be fatal! Reason #5 to give your pet heartworm preventative every 30 day year-round: Current treatment protocols require 5 to 6 months of strict rest. That means no running or playing throughout that whole time period! Reason #4 to give your pet heartworm preventative every 30 days year-round: Without treatment, heartworm disease can cause significant lung disease and even death! Reason #3 to keep your pet on heartworm preventative every 30 days year-round: This medication is killing multiple types of worms every month that your pet gets from eating things they shouldn't. Does your dog eat deer and rabbit poop? Mine does when she gets the chance. Did you know your pet can transmit many of these worms to you or your children? Reason #2 to give your pet heartworm preventative every 30 days year-round: the monetary cost of treatment. According to the American Heartworm Society one year of prevention costs $70 to $200 on average but treatment can easily be $1200 to $1800.